As you already know, I LOVE my job. It is hard to call it a job, because everyday is different. I do not have to go to an office, I shoot on location. I never know what I am going to find. Sunday, was no exception. I got a very last minute booking for a maternity shoot. It worked out perfect. I got up early Sunday morning and headed to meet Sarah and Nathan, not knowing what to expect. When I arrived I met Sarah and Nathan. They were as cute as could be. I also met the cats, Leo and Hugo, the pet rat and Seamus, the sweetest Boa Constrictor you have ever met. Sarah thought it would be fun to include the first “babies” in some photos, if that would be ok. I couldn’t wait. We had such fun. I got to hold Seamus. He was so sweet, but very strong. 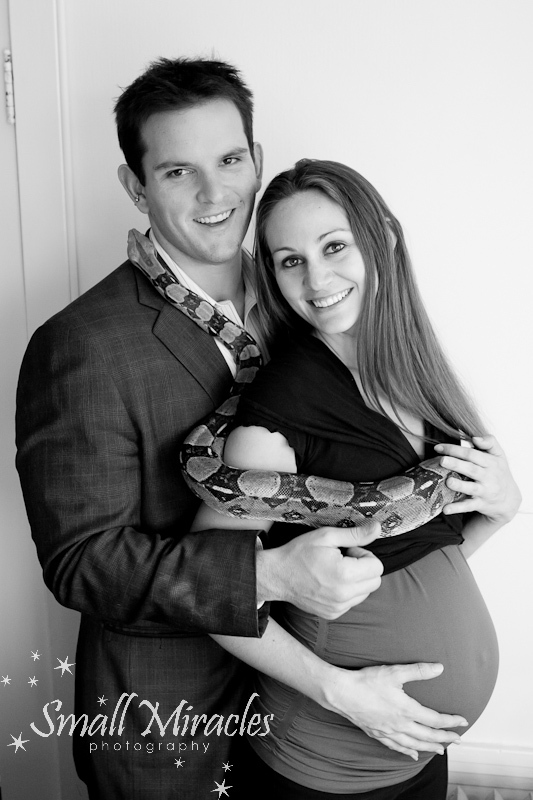 Who knew when I woke up that morning, I would get to photograph a snake with my pregnant couple? This is what I love about my job, the unknown. It used to scare me in the beginning. Not knowing what the lighting would be, or what the space would be like, but now I actually enjoy the unknown. Can you see why? What a great shoot, a fabulous couple and fun pets!